Don’t let the clunky odd title deter you. Missing Noir M is a gem of a show and possibly the best police procedural OCN’s put out yet. I watched Bad Guys for the grit and madness and blood. 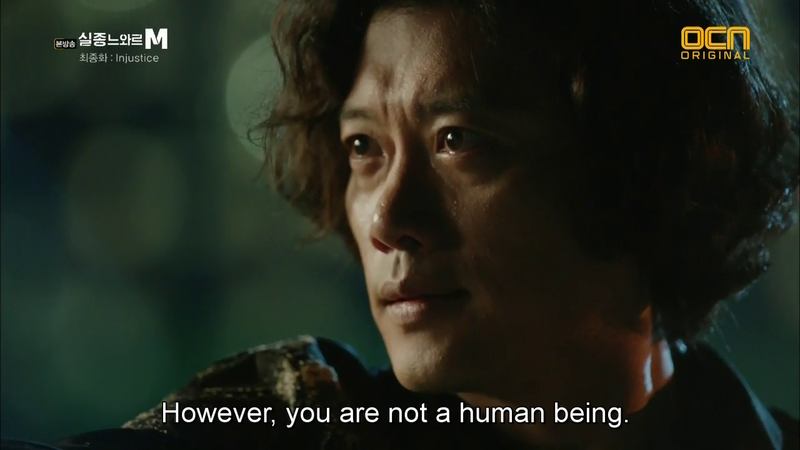 I watched Missing Noir M for the smarts. This show was honestly brilliant, from the cases to the bad guys to our lead three investigators (four if you count the coroner). Cases often come in sets of two episodes each and honestly, each episode packs quite the wallop in terms of emotional intensity. 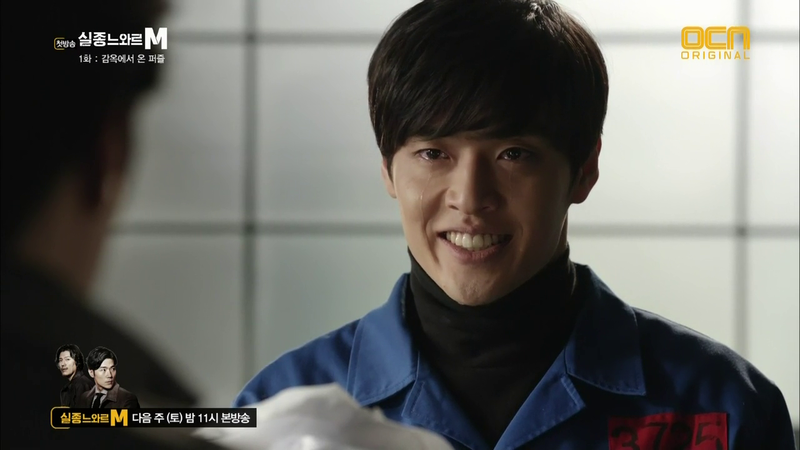 Kang Haneul (who seriously needs a lead role soon) takes an electrifying turn as a criminal in the first two episodes. 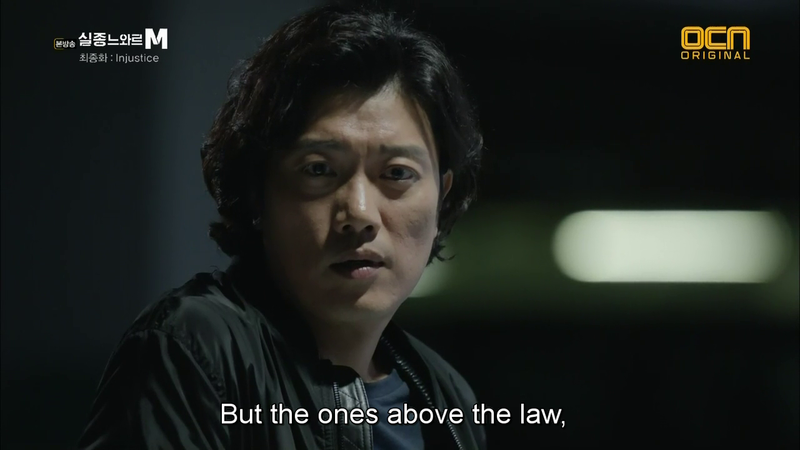 And the remainder of the supporting cast, both English and Korean, is just as good as the main cast, which is one of the things I love about OCN because other networks just don’t bother making sure that happens (*coughcoughHeirs*). Onto the characters! 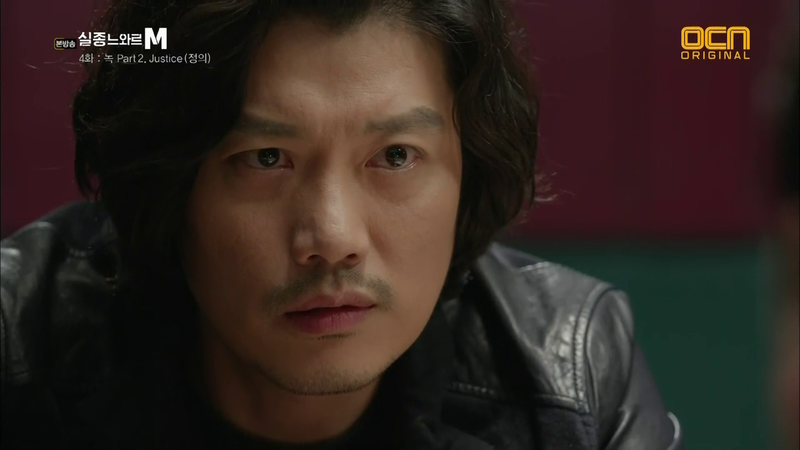 Park Heeson plays Oh Daeyoung (ODY), a detective with over 20 years of experience who is assigned as GSH’s parter. He has pretty good intuition and works well with GSH though they do tend to argue over certain matters. He’s StreetSmarts. And the final member of our key trio is Jo Boah as Jin Seojoon (JSJ) who’s a brilliant hacker and without whom our boys would be lost. She’s TechSmarts. Finally, we’ve the medical examiner who aids them on their cases, so DocSmart. All in all, the perfect team. Mega spoilers ahead so don’t go on unless you want the series spoiled for you! I’m quite bad at talking about a show as though I’ve yet to see it or without spoiling keys parts of it, so chances are that those of you reading this post to get an idea of what the show is about are going to be very confused. All I can say is, watch it! You won’t regret it! The cinematography is nothing too special but the choice of music is fantastic. There’s a piece with some sort of violin or cello that never fails to give me goosebumps. There’s an air of fear and despair throughout every episode. Some delve into the macabre at times as with the first couplet. The ambiance is often eerie, and the cases are rarely what they seem to be. The show pulls out the big guns in terms of whom our heroes are dealing with: cops abusing their power, pharmaceutical companies, worker unions, homelessness, scamming rings, and the 0.1%. And they land under the umbrella of the overarching theme of this series (season? ): justice. GSH has set notions on what justice means. To quote an officer quoting him : “The suspect was arrested but was justice delivered?” In other words, he doesn’t trust the justice system to mete out a fair sentence for a criminal. More often than not, he won’t hesitate to take just into his hands like in episodes 7 and 9, but not unless he absolutely has to. He’s no hothead, though there are times when repressed emotion rises to surface and plays havoc with his eyes. I swear you can see what he’s thinking just by looking into his eyes. 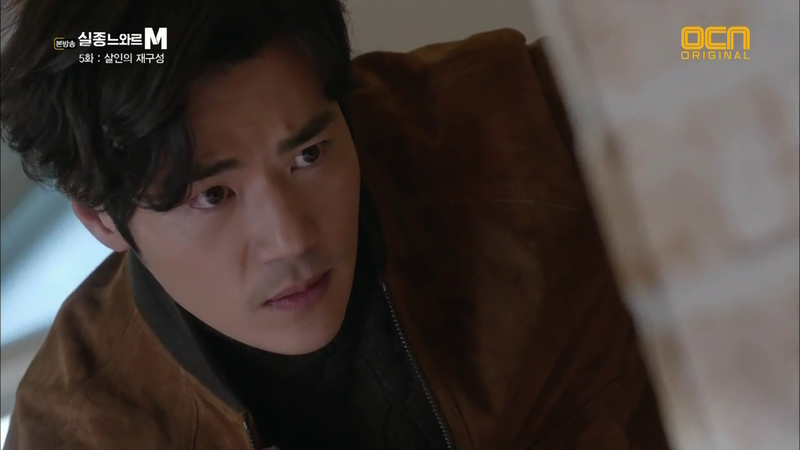 Kim Kangwoo is honestly such a brilliant actor. GSH is well aware of the limits that even someone with his investigative rights has, and makes sure to keep to them unless there’s no other option. 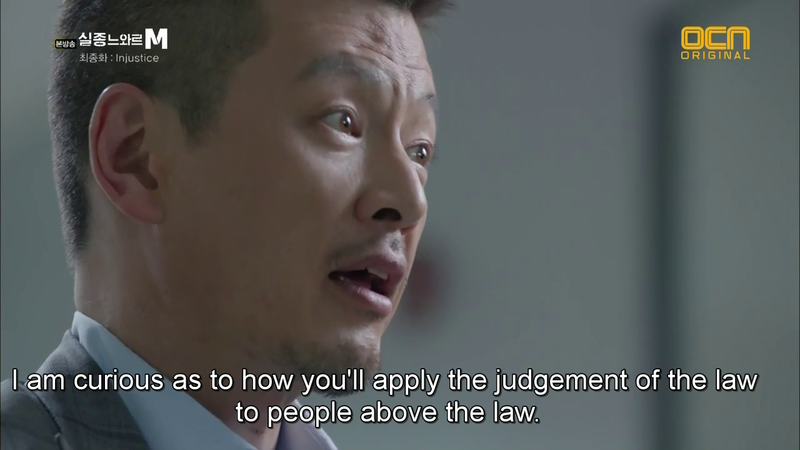 And when justice fails, he steps in, even if he has to work from behind the scenes as in ep 6 when he made sure that the recording of that dirty politician/former lawyer were released. Yet despite all that, some part of him still holds out in hope that justice is not dead, that it won’t be dead so long as there are those that walk the right path. Oh Daeyeong is a different matter. Our first glimpse of him with when he’s studying a law book. “To enact law one must know law,” is his motto and it’s a damn fine one at that. Yet as the cases go on, without him even noticing, that proud life motto starts to erode, as he sees just how dirty the world can be. It crumbles during ep 7 and shatters during the finale. He burns the law book, after his wife’s kidnapping, deciding to take justice into his own hands, with catastrophic results. 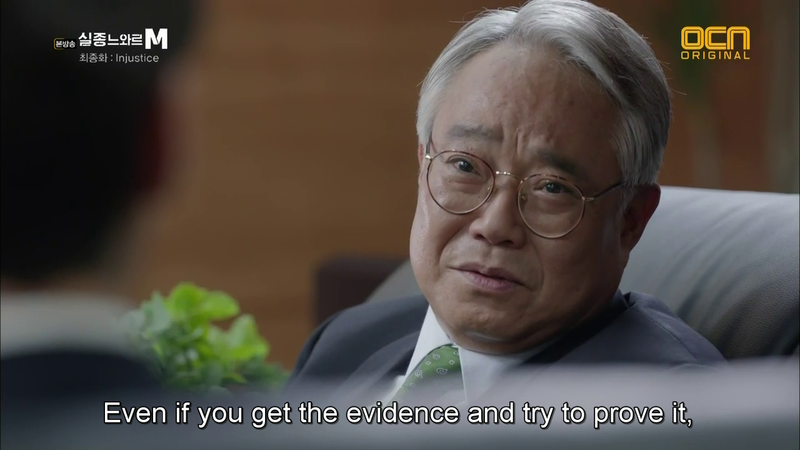 Like GSH, Jin Seojoon is well acquainted with how dirty the world really is. Hence why both her and GSH go through the least change regarding their views on justice throughout these 10 episodes. I loved her character, how brilliant and resourceful she was and how her being a woman never once had any impact on the series. Same goes for Doc. Something I love about Korean shows is how well they display the struggle between the everyday man and woman and the wealthy that rise above them all. Korean shows have no reservation in pointing their fingers were the blame belongs. 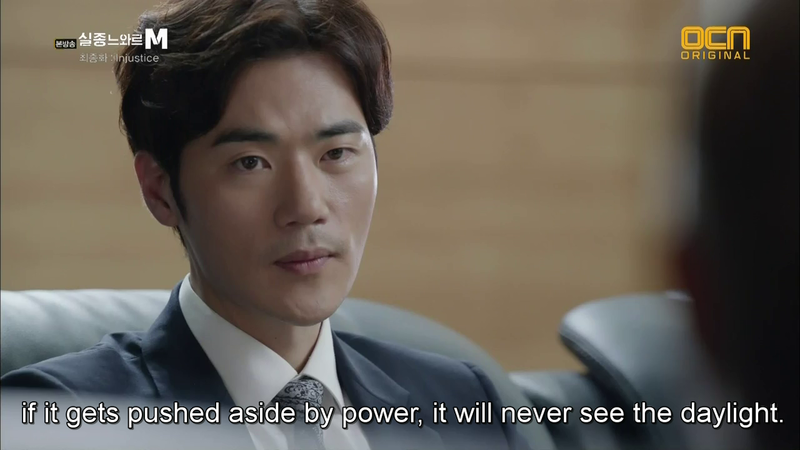 And unlike Western television that shys away from the politics of the matter and merely directs a shaking finger towards drug lords and mob bosses, an army of Korean shows wave flaming torches towards the government, towards the prosecutors, the judges, the 0.1%. 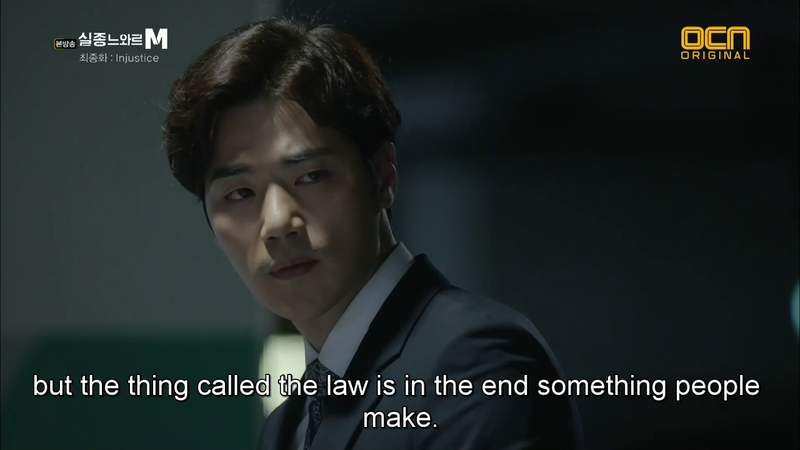 From even shows like You’re All Surrounded to Golden Cross to Bad Guys to Lawless World to Healer to Angry Mom to Missing Noir M (and that’s all I got off the top of my head for only the past year!) they have little issue with placing the blame where it belongs and showing that you can never win. And the latter realization only strikes ODY this final episode, hence why he crumbles completely. It’s a realistic and gruesome depiction of the world with all its flaws and faults laid bare, and with every case the same point is hammered home: there is nothing you can do about this. Perhaps then it’s fitting for Missing Noir M to end of a note of utter despair with GSH barely clinging onto hope, JSJ choosing to abandon the law completely (as evidence in her turning over that photoframe) and ODY left as a shell of a man. If so, I wouldn’t complain. The show has done it’s job extremely well and posed some brilliant and painful questions in the process, as shown below. But one does not merely watch a show for its plot but for its characters, and there the finale was woefully inadequate. 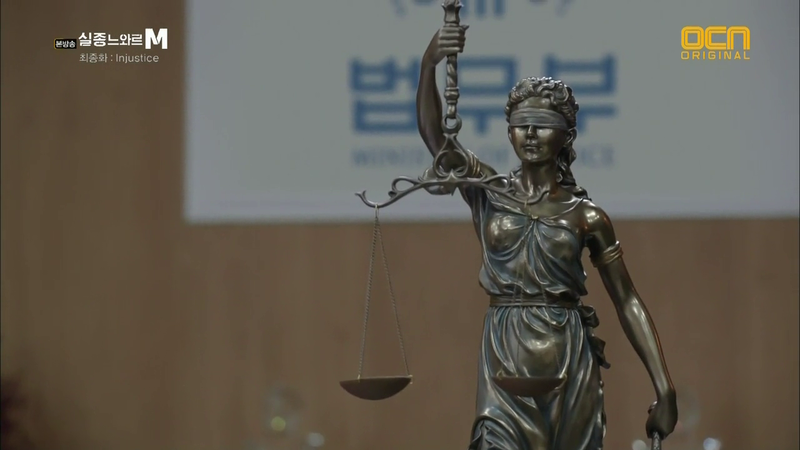 You see, the cases are intriguing on their own as is but what makes this drama so great is how the layers are peeled back on our leads during every one of them. Gil Soohyun, for example, is shown numerous times to pop pills, the reason for which is unclear. He clearly isn’t abusing prescription medicine but there’s something more to him that we see (something that I wonder if we’ll ever know). There’s a slightly manic air to him at times, like in episode 4 when he wildly told the woman to go ahead and inject the child with the faulty vaccine. The 631 of the 2nd episode was made clear in the 10th the 3 people he saw killed were his own family and the person he searches for is the man behind the man responsible for their deaths, as the latter was a puppet, led to have believed that GSH’s brother had murdered his (the puppet’s) family. So then who is the mysterious person we see GSH searching for, at the start of the first episode and at the very end of the tenth? 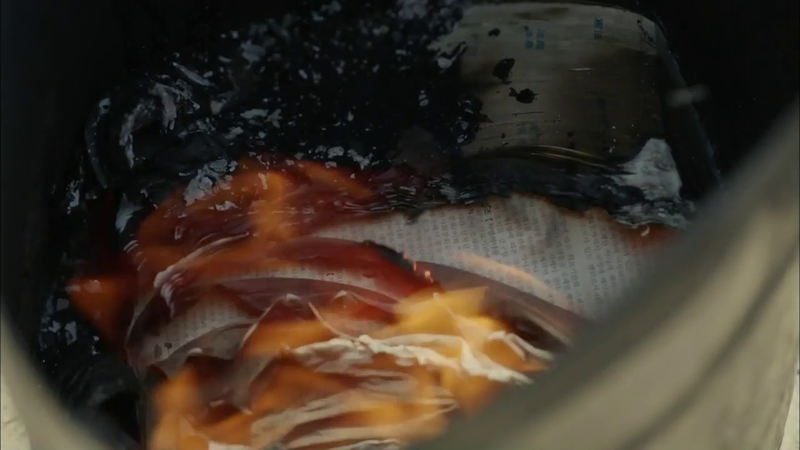 At the end of the finale he shakes out a pill but decides against it upon being reminded of ODY’s fate in the news, placing the box on the table in a very final way. Just what are those pills for? Medicine is typically for repressing something, be it bacteria or an imbalance of hormones. 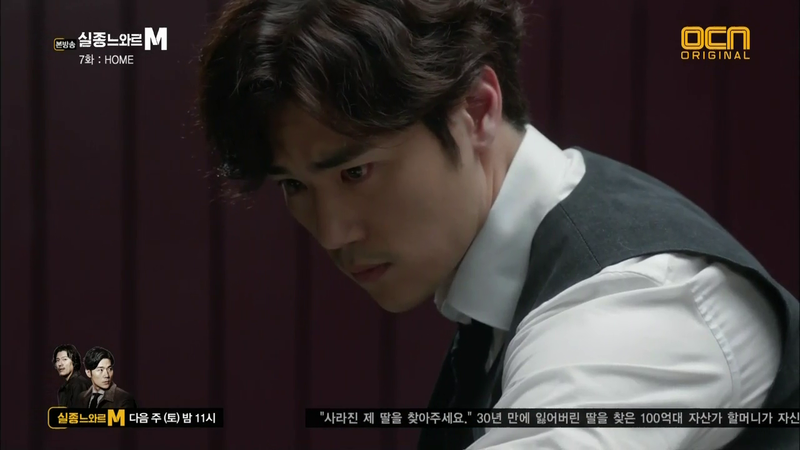 So what’s going to happen to Gil Soohyun now that he’s stopped. Will we ever know? On the other side of the spectrum, we’ve ODY’s whose pregnant wife was kidnapped in the series (season?) finale, but we don’t see whether he rescues her or whether she’s gone for good. We don’t even see ODY’s fate after having shot that CEO. 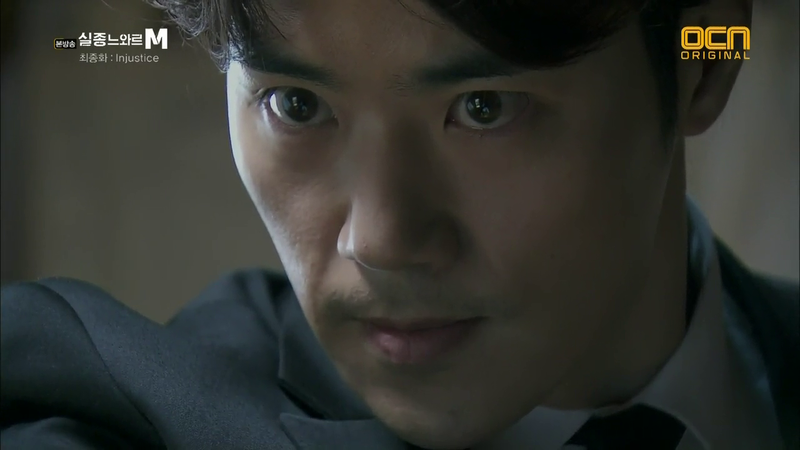 Jin Seojoon is probably the character whose secrets are outed the fastest and answered just as quickly in an utterly heartbreaking episode. But as her eyes turn cold when she overturns that photoframe, we never get to see what she does next. It’s frustrating and utterly baffling. I’m not sure if a season two if in works or not, but given that finale, it had better be for watchers to continue to be able to trust OCN for great shows. Because to build up all these question questions and themes and characters only to leave viewers hanging makes no sense. Even if this is to have a second season, I’d have thought that they’d wrap up the first. Heaven knows, OCN hasn’t had a problem with that before. Take God’s Quiz for example. I feel as though I just bought an absolutely riveting book only to find that the author thought it would be a great idea to end the book mid-sentence. That can’t be it! And yet it is, apparently, which is unbelievably strange. OCN’s next offering (also a police procedural which promises to be great) starts on June 20th and is the first of their to air twice a week as opposed to just once. Meaning that we’ve three weeks with an empty slot and yet the series wasn’t extended. I’m still trying to wrap my head around it all. 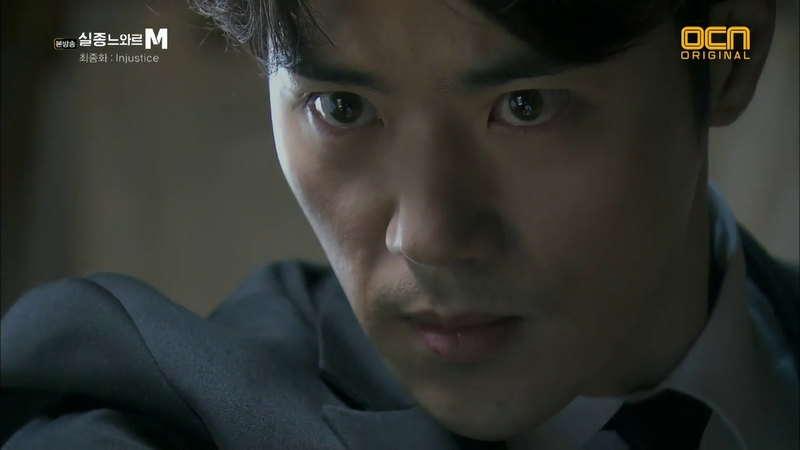 Nevertheless, here’s to Missing Noir M, a fantastic, heartwrenching show with painfully human characters. Perhaps that finale is a good thing. Especially if it means that I can see more of you. And here’s a rare smile from GSH to tide us over until the next season. Come quickly!!! I just discovered your blog which is very great! I hope for a second season too or the evening will be a bit disappointing. And I like the characters, I want to see them again! I agree that was episode was not an ending, it was a middle. 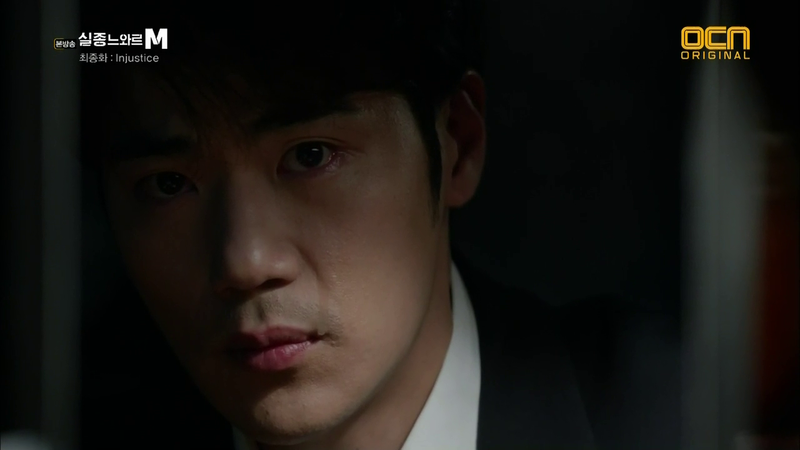 On the plus side most of OCN’s shows do get a second season, it’s just the third and fourth seasons we want after the second one we never get.